RHOC’s Shannon Beador Stopped Speaking to Tamra Judge After Watching the Jamaica Episodes, Is She Still Friends With Vicki Gunvalson? Shannon Beador cut ties with nearly everyone after watching the Jamaica episodes play out on the 13th season of The Real Housewives of Orange County. While preparing to film the reunion special at the end of last month, Gina Kirschenheiter, Tamra Judge, and Vicki Gunvalson revealed where they each stood with Shannon after their dramatic Caribbean vacation. “I don’t speak to Shannon. You know, Shannon doesn’t speak to me and I personally feel like if there’s any fallout pertaining to the text messages it wouldn’t be directed at me but more at what her friends were saying on that trip,” Gina said during a backstage interview with Bravo TV. “I think Shannon was really disappointed in how we talked about her when she wasn’t there. So, I regret that,” Vicki added. During Monday night’s episode of The Real Housewives of Orange County, Shannon and Tamra sat down to discuss the things that have been said about Shannon’s recent behavior and the way in which she was coping with her messy divorce from David Beador. Months later, Tamra revealed Shannon has completely cut her off and is now talking only to Vicki. “Watching it, I probably should have been a little more compassionate. So, that makes me feel sad for her,” Vicki admitted. According to Tamra, she attempted to reach out to Shannon prior to the dramatic scenes of the latest episodes but didn’t hear back. “I sent her a message that day and I’m like, ‘Hey listen, you know, I know it is a hard episode for you but I love you and this was so long ago.’ But, she lives in TV time,” Tamra explained. “[We] talked 100 times a day. So, it all goes back to that whole ‘icing out, poor me,'” Tamra added. As reported, Shannon ultimately made up with Tamra and Vicki during the RHOC reunion filming. However, things took a turn for the worse between Tamra and Shannon again this week following Monday’s episode. 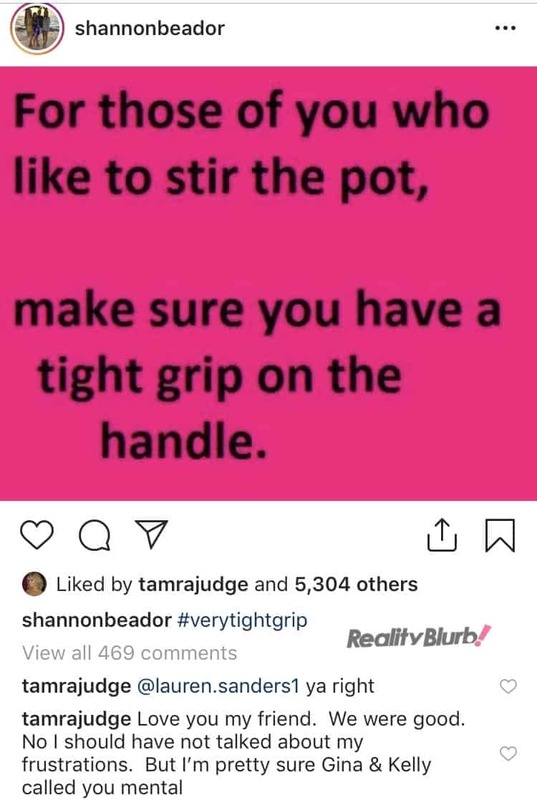 After that episode aired, Shannon made a post on Instagram about people who like to ‘stir the pot.’ Tamra believed Shannon was referring to her and defended herself, stating Gina and Kelly Dodd were the ones who were questioning Shannon’s mental health and not her. “Love you my friend. We were good. No I should have not talked about my frustrations. But I’m pretty sure Gina & Kelly called you mental,” Tamra replied. The Real Housewives of Orange County airs Mondays at 9 p.m. on Bravo TV.